The agreement may be signed during a visit later this year by Indian Prime Minister Narendra Modi to Iran. India, Iran, and Afghanistan have finalized the parameters of a trilateral agreement known as the Chabahar Agreement, which will allow India access to Afghanistan via the strategically located Iranian port of Chabahar, which sits on the Gulf of Oman. The Chabahar route to Afghanistan will allow Indian goods to reach Afghanistan without having to first bypass Pakistan, which has a limited trade relationship with New Delhi due to diplomatic tensions and a territorial dispute between the two countries. 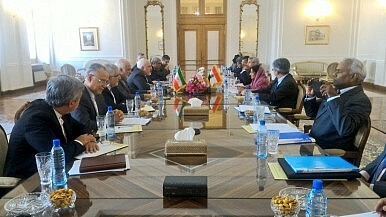 The finalization of the Chabahar agreement comes after a visit to Iran by an Indian diplomatic delegation led by Foreign Minister Sushma Swaraj. Swaraj arrived in Iran on Saturday, her first visit to the country as India’s external affairs minister. In Iran, she met with her Iranian counterpart, Javad Zarif, the Iranian president, Hassan Rouhani, and Iran’s supreme leader, Ayatollah Ali Khamenei. Swaraj additionally addressed members of Tehran’s Indian community at an Indian school and a Sikh Gurudwara. Swaraj and Zarif additionally discussed an accompanying project: the railway link along the Chabahar-Zahedan-Mashhad route, connecting the Iranian port with the Iranian cities of Zahedan and Masshhad, along the country’s eastern border. The completed railway will extend 1,380 kilometers. The Economic Times, citing Indian foreign ministry spokesperson Vikas Swarup, notes that India will “supply $400 million of steel rails” for the railway link. Indian Prime Minister Narendra Modi is slated to visit Iran later this year. The final signing of the Chabahar agreement will likely occur during his state visit. India and Iran had first broached the idea of Indian access to Chabahar in 2003, when they agreed to jointly develop the port. In part due to increased Western sanctions against Iran over its nuclear program and India’s rapprochement with the United States following the landmark 2005 framework between the two countries, the development of Chabahar stagnated on the India-Iran agenda. Last year, in May 2015, two months before world powers and Iran announced the Joint Comprehensive Plan of Action on Iran’s nuclear program, Indian Transportation Minister Nitin Gadkari visited Iran to sign a memorandum of understanding on Chabahar. Last week, ahead of Swaraj’s visit to Iran, representatives from Iran, Afghanistan, and India met in New Delhi to finalize a draft of the Chabahar agreement. The finalization of the Chabahar agreement is not only an important development in the India-Iran relationship, but it also shows that New Delhi is serious on delivering on its commitments in Afghanistan. In December 2015, when Indian Prime Minister Narendra Modi visited Afghanistan, he and Afghan President Ashraf Ghani discussed Chabahar and urged a conclusion of a final agreement. The increase in connectivity afforded by the port could allow Afghan exports cheaper access to markets in India. Currently, an overwhelming amount of Afghan manufactured goods travel through Karachi, Pakistan. In February 2016, Afghan officials said that Afghan exports through Karachi had declined 40 percent amid political tensions between Kabul and Islamabad. On Chabahar, New Delhi seems to be caught in a Catch-22 situation.